Last March we released our integration with Unicheck, a web-based plagiarism-checking service. Since then Populi users have checked tens of thousands of student assignments for plagiarism against Unicheck's index of Internet-based sources, open access libraries and journals, and documents already uploaded to their school's accounts. Unicheck has a special offer for Populi customers: If you sign up for an annual subscription by March 31st, 2019, you'll get two months of plagiarism detection for free. For more details, contact Unicheck and let them know you're with us. Using Populi to detect plagiarism is simple. 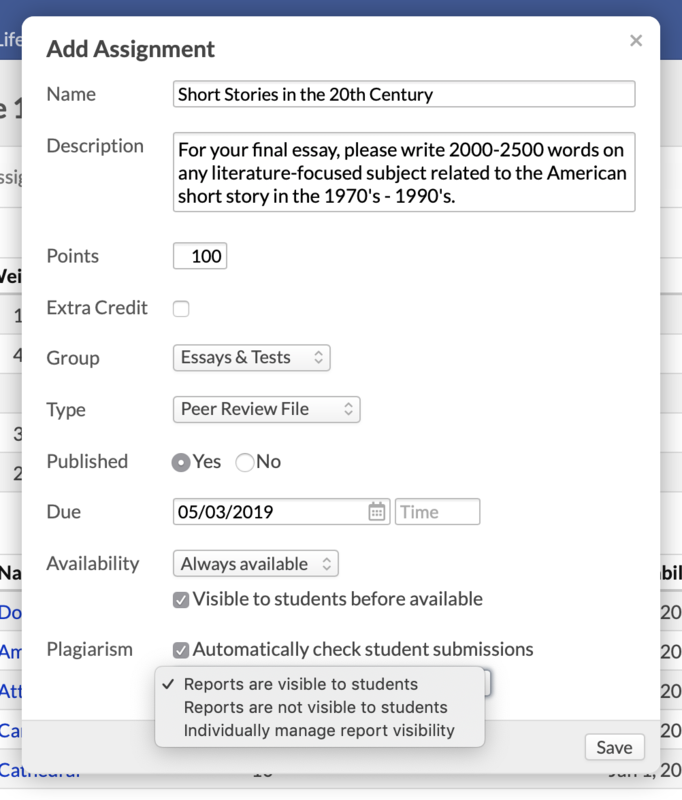 After entering your Unicheck credentials in Account > Integrations, your faculty will have options to check student submissions for file- and essay-type assignments (including peer review assignments), discussion comments, and test essay questions. As students submit work, they'll be checked automatically or ad-hoc (however the faculty has set it up). Once the check is completed, you can access the Unicheck report right from the assignment, discussion post, or test question. 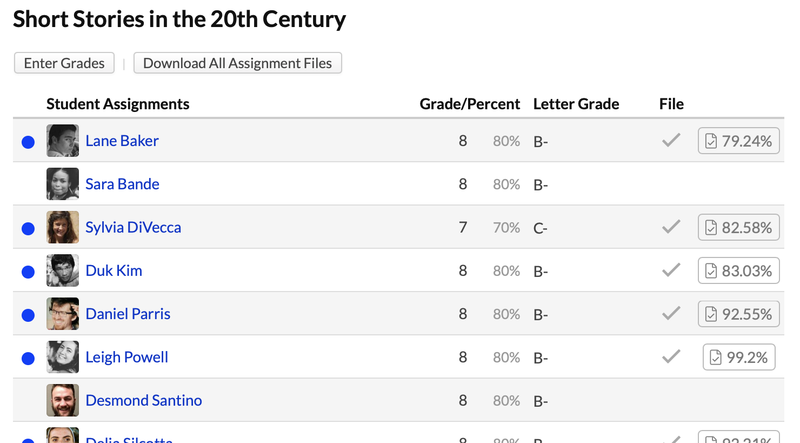 You can also see the Unicheck originality score on assignment pages, letting you see at a glance which submissions need a closer look. Get all the details you need in the Populi Knowledge Base, and read more about Unicheck's Originality Report at their support site. Give alumni a place to keep up with each other (and keep them in the loop for donation campaigns). 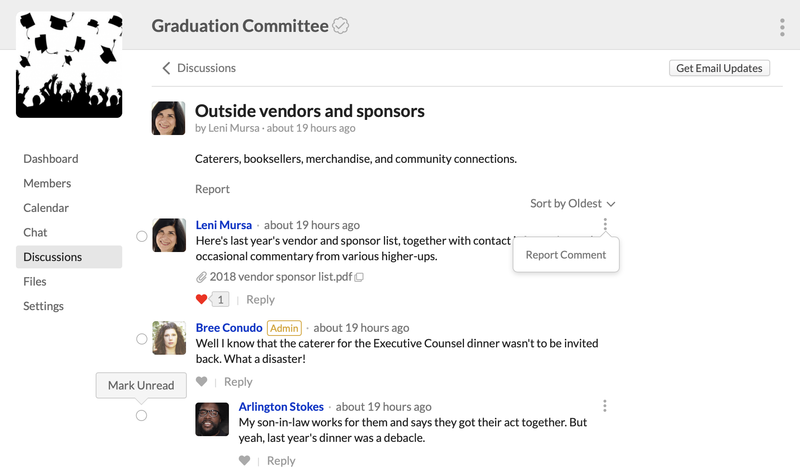 Provide an organized way for thesis directors to coordinate graduate work with thesis advisors. Give student clubs and teams (the chess club, the drama kids, the rugby ruffians, STEM majors who play with Legos) a way to get off Facebook and have a place in Populi. 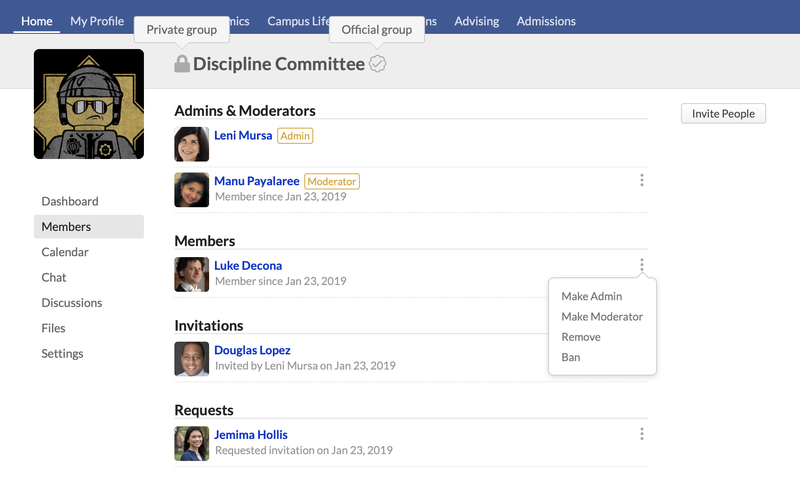 Help manage special committees and projects—student government, the board of trustees, discipline committee, faculty hiring, and so on. Collect training videos, FAQs, and other resources to onboard new faculty and staff hires. 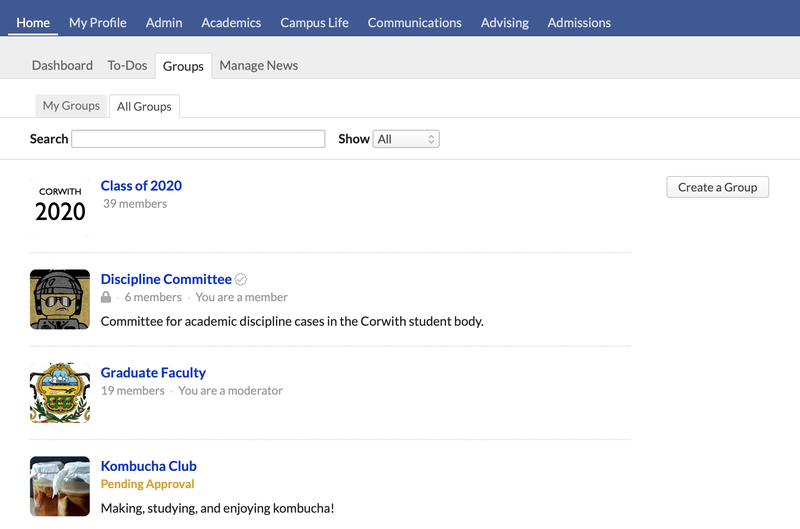 Everyone can find Groups when they log in: the new Groups view is right on the Populi Home page. Membership can be open to everyone, open to particular roles, or invitation-only. Each Group is overseen by administrators and moderators. Groups can be public or private, and you can mark them Official if they concern important school business. Groups include a bulletin board, chat, discussions, and shared calendar and files. They're similar to courses and it'll be simple for your users to get the hang of it. Group admins can control how members participate in each of these functions. We're really pleased to get Groups out to all of our customers. To learn more about them, have a look at the new Knowledge Base articles and the Groups topic in the User Forum. Merry Christmas and a Happy 2019 From Populi! From everyone here to all of you who made 2018 a great year to work at Populi, we wish you a very Merry Christmas and a Happy New Year. We’re soon to release a big update to payment plans. The improvements include new types of payment schedules, editable deadlines, a more flexible and reliable structure, new reporting tools, and a lot more. Here’s a look at what’s just ’round the bend. First, why the update? We had several goals—and several problems we wanted to solve—with this release. Payment plans required a bit too much babysitting from users to make sure the right charges got on the plan, not to mention getting the payment deadlines to handle unusual situations. Payment plans needed to be more of a set it and forget it deal, one that could roll with whatever punches you threw at it. Payment plans didn’t work with recurring payments. Information about student payment schedules was hard to come by, to put it mildly. Payment plans didn’t behave the way one might expect them to—if you wanted a student to pay $400 a month until he was paid off, there wasn’t a way to make that happen in Populi. You set up a payment plan—see below for some of your new options. Set it at the student level (on Profile > Financial > Dashboard), and it will automatically pick up all of the student’s plan-eligible invoices. Set it on the term level (Profile > Financial > By Term), and it will only pick up the plan-eligible invoices for that term. You can also apply it to individual invoices. You can add it to students one-at-a-time, or to a group of students by using the Data Slicer. As soon as it’s applied, you’ll see the payment schedule on the student’s profile; you can find all payment schedules on the new Payment Deadlines report in Billing. Time passes, and students pay. Along the way, you might need to adjust a deadline or an amount. Or you might need to add new invoices or remove one from the plan. Or you might need to recalculate the payments. All these actions are now super-simple to do, leaving you more time to work on your novel or refinish the teak decks on your yacht. Fees: Payment plan fees can be either flat-rate or a percentage of the charges on the plan. Late payment fees can be flat-rate or a percentage of the amount due, can be capped at a maximum amount, and be applied after a grace period. Rounding: If you wish, plans can automatically round regular payments to the nearest whole-dollar amount (any stray cents will be thrown in with the Balance Due amount). 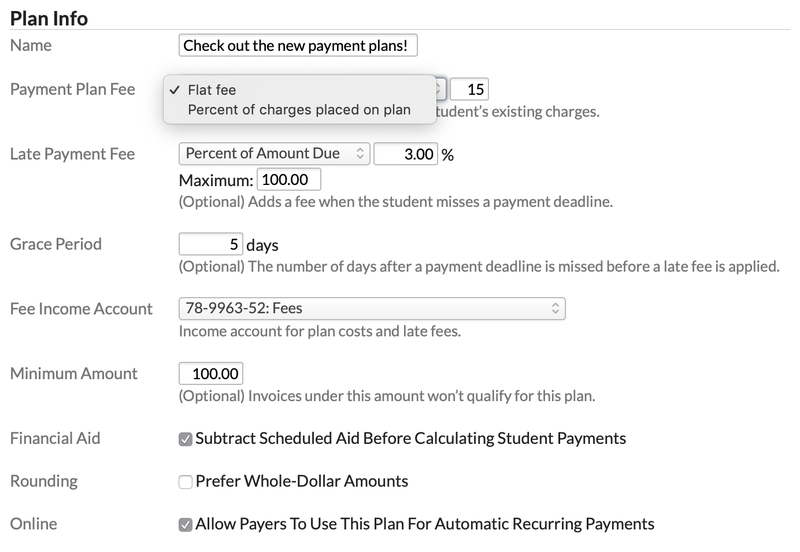 Online: If your school uses Stripe and has enabled recurring payments, you can let students choose a payment plan when they’re on the Pay Now screen. They’ll then be charged according to the plan’s payment deadlines. Four types: You can base payment schedules on specific calendar dates, the number of days into the term, the number of days after the plan is applied, or regular recurring payments of a set amount. 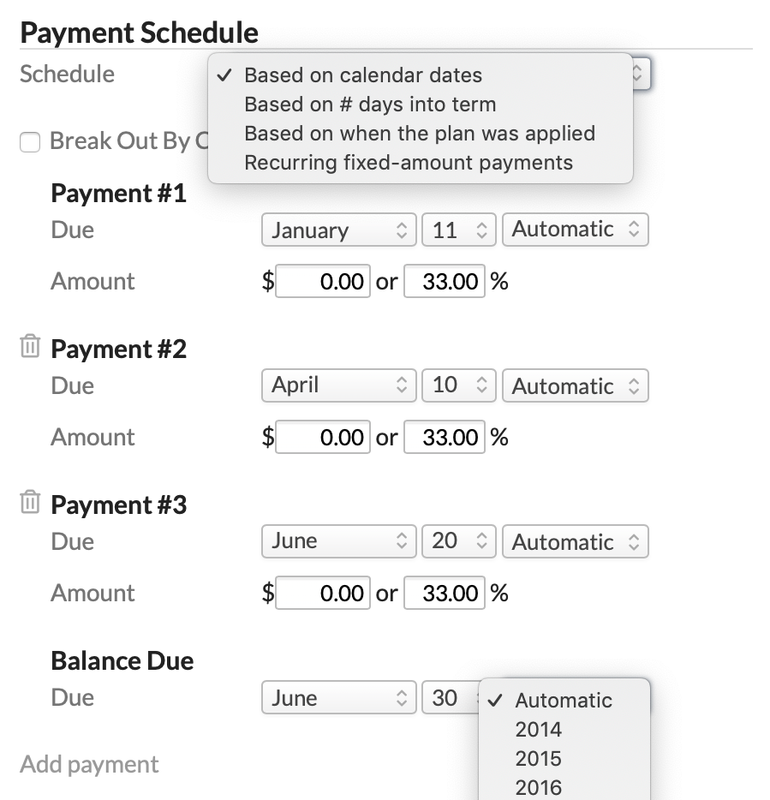 Calendar dates: The year selector lets you choose specific years for payment due dates, or you can select Automatic to let Populi figure it out. Recurring payments: Set up a specific amount to charge payers at whatever interval (every month, every four months, every year, etc.) you choose. Payments will be scheduled for every month in which the student has a balance. If you need to change a specific payment date or amount, you can do that as-needed (see below). All of these schedules work with plans you make available for students to choose online. The old based-on-invoice-date option is gone (but we don’t think anyone’s gonna miss it!). You can move individual invoices on or off the payment plan as-needed. When you do, the plan will automatically recalculate the payment schedule. Any time you need, you can edit the payment schedule: change deadline dates, amounts, add new payments, or even delete payments. If you need to reset everything, just recalculate the payments to return the student to the plan’s basic payment schedule. Or you can remove the plan altogether. We added a new report, updated an existing one, and suped-up the summary on Profile > Financial > Dashboard. 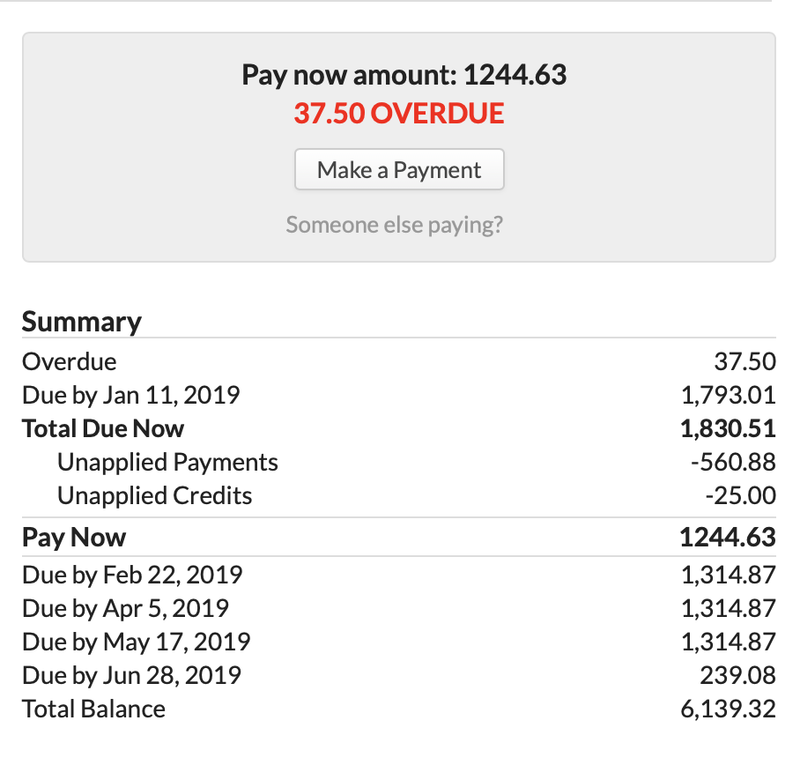 The new Billing > Current > Payment Deadlines report shows you every payment due date, including those generated by payment plans and those from individual invoice due dates. The Recurring Payments report and the Data Slicer have a number of new columns and filter conditions to help you get at plan-related information. Student financial summaries now include exhaustive detail on all the deadlines, unapplied payments, and unapplied credits affecting the student’s balance and Pay Now amounts. But first, let’s have a quick look at the current registration screen and some of the problems we wanted to solve. It shows a dense list of available courses together with some salient details: schedule, faculty, number of openings, and so forth. Courses available for enrollment are intermixed with those for auditing; courses for which students cannot register are just as prominent as the ones for which they can. 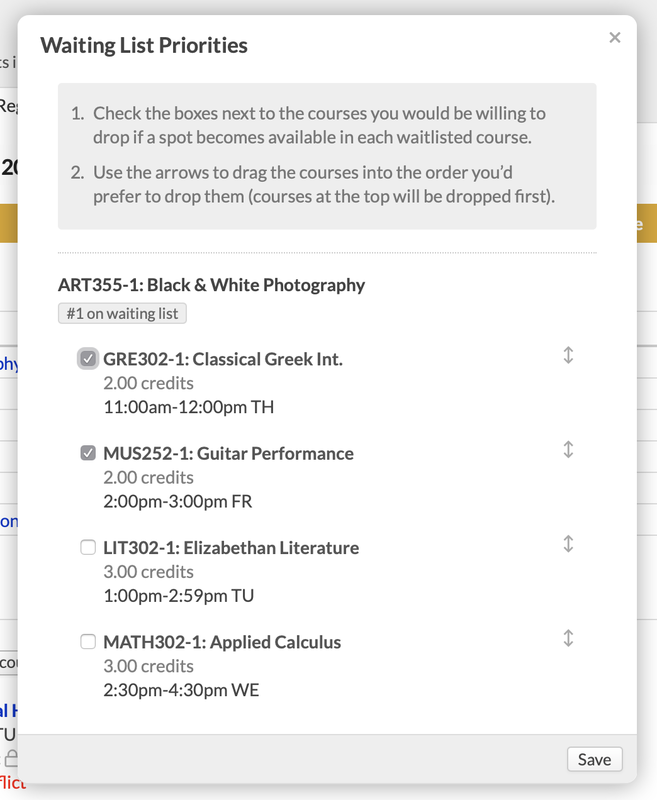 Finally, there’s no way to get on a course waitlist, nor is there any way to indicate courses the student would like to drop in case a spot opens up. The new features improve the registration process on all these points. There are two sections: Offered Courses and Selected Courses. Offered defaults to show only Available courses without conflicts—that is, courses in which the student may enroll. It excludes courses from other programs, those with conflicts (schedule, prerequisites, term enrollment limits), and those not offered on the student’s campuses. Students can also look at Available courses (which may have conflicts) and All courses (which may include courses in which they cannot enroll). Each course offering has more information—whether the student has already passed it, how many openings (enrolled and auditing), and what conflicts exist. 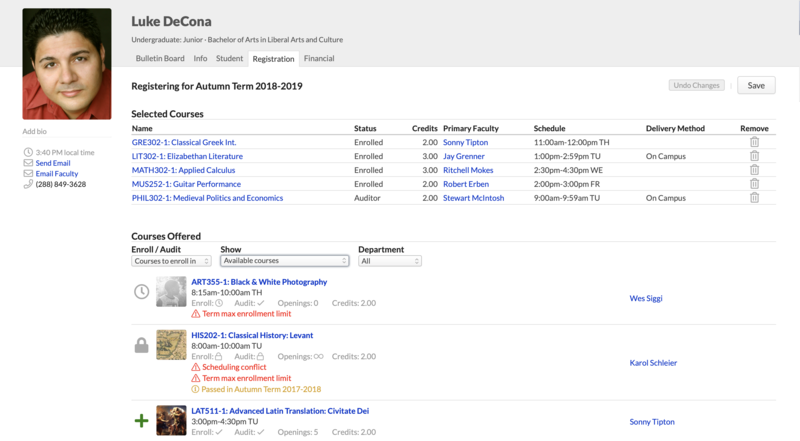 The screen lets registrants toggle between courses for enrollment and auditing. To register, the student clicks the green plus sign. 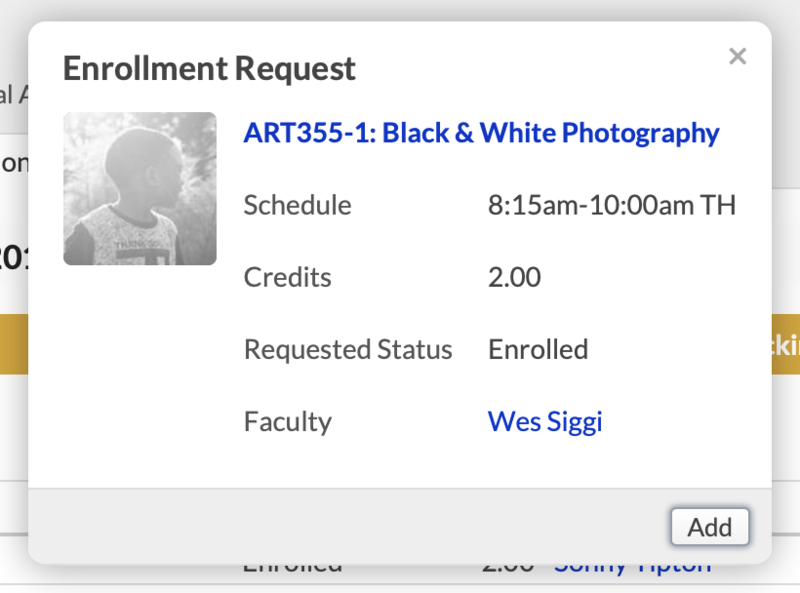 This creates an enrollment request that, when confirmed, appears under Selected Courses. As Selected fills up, Offered instantly updates to show what’s still available that works with the student’s schedule and other constraints. Once the student has selected all the courses she’s after, she’ll Save to submit the requests. Finally, the new “Waitlist Over-enrollment” feature will take a huge load off your waitlist workload. Once enabled in Academics > Settings, students can click the clock to request the next spot on that course’s waiting list. When she saves, Populi will check to see whether the waitlisted course conflicts with a term enrollment limit or the student’s schedule. If that’s the case, she’ll be able to choose which courses she’s willing to drop if a spot opens up. 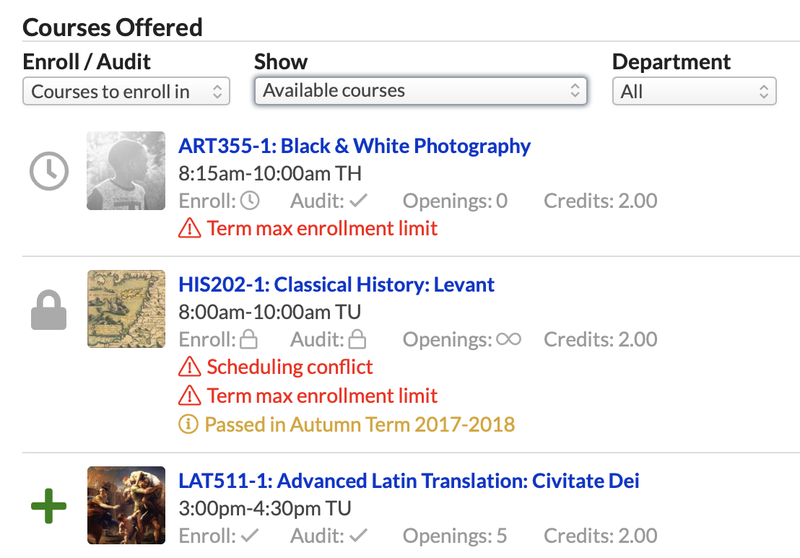 Should that happen, Populi will automatically drop as many of the chosen courses as necessary to move her off the waitlist and onto the rolls. Lord willing and the creeks don’t rise, we’re planning to have the new registration features out to all our customers the third week of October.